I can’t believe another year is coming to an end already. 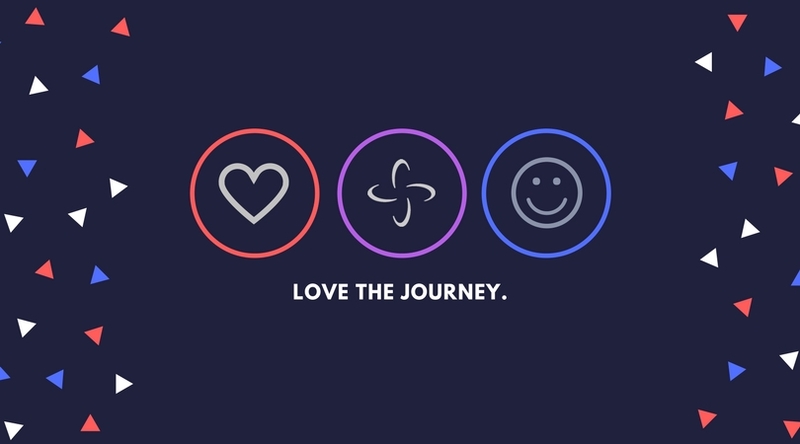 I’m so happy I keep this blog so I can look back with a huge smile on my face as I see all the amazing opportunities I have had and all the amazing people I had the pleasure of being with. I had the privilege of training with some of the best in the World, I was fortunate enough to instruct and share my passion for Taekwon-Do, have been improving in Track and I was accepted as a Public Speaker and hopefully made a difference for a few people. I’ve constantly pushed my own limits. For so many years I only focused on sports and I thought that was perfect. Now I still have sports as my main focus but I also have been discovering other passions and interests in my life too. 🙂 Sports has given me the confidence, courage and persistence to try new things and work hard at them. This year I had the pleasure of training with some of the very best TKD Practitioners/Athletes in the World. I thoroughly enjoyed attending as many seminars as possible and even had the opportunity to give my own seminars which was extremely fulfilling. Helping instruct the classes and being the Head Competitor Coach has been very rewarding as well. I was pleased with all my tournament results over the entire year. I continue to get stronger, more fit and more expereinced so I am really excited for next year’s competitions. 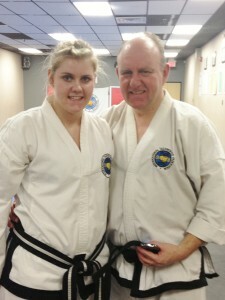 I also really enjoyed training again with my dad. I’ve been extremely happy with the way the winter training is going for all three throwing events. I’m not sure why, but recently things are just clicking into place for me. These throwing events are extremely technical and they take a lot of patience and an eager attitide to learn and improve. I love my coaches and the people I train with so it’s always fun. I learn something new every single practice which is what keeps it so interesting and motivating to keep pushing! It’s all about the tiny breakthroughs 🙂 This is going to be an exciting year for competition as well. Being a part of the Link Cre at school has been a great experience for so many reasons. I feel like I can actually make a difference for other students with all the amazing activities that we do. After attending different workshops it’s obvious how much programs like this help with the entire school population. Not only am I learning about the program and how to make it great, I am learning about myself and really getting involved with the school. I’m also working hard on preparing the Leadership Camp in the Spring. I’m not sure if it will even happen with the Bill 115 but I’m going ahead as if it will so we will be ready. One of the things that our school works really hard on is the Anti-Bullying campaign. Imagine the impact these t-shirts have when you see an entire high school wearing their signed pledges against Anti-Bullying!!! Every little step towards anti-bullying helps. 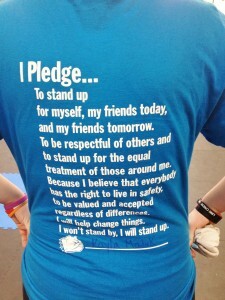 Every student was given a shirt when they signed the pledge. Awesome! Over the last year I’ve had the opportunities to speak in front of large groups of students about goal setting. I am always trying to challenge myself and do things out of my comfort zone since amazing things can happen. I’ve written my own simple 5 steps of goal setting and it can be geared for any age group. I’ve had really positive feedback from the talks and still receive letters from people with their updates. This is something that I really want to do more of in the future. I’m also on the Speaking Bureau for the Because I Am a Girl campaign. I’m sure there will be many more opportunties with them next year. Right now there are limited events at schools with the teachers’s ban for extra curricular activities. The older I get, the harder the school work is but I’m realy lucky for the High Performance Athletic Program at John McCrae High School. I get more one-on-one learning in the harder subjects like math. Since I train so many hours every week between the Taekwon-Do and Track getting my homework done is definitely getting harder but fortunately I have great teachers to help me and I am trying my best to get everything done! I want to maintain my honour role status this year again as well. I know it will be hard but I am trying my best 🙂 Marks are becoming more important now that I am starting to think about which university I want to got to. The ban against Bill 115 has completely changed the school year. All the extra things that are so important to students are not happening. Sports, Arts, Music, Drama and several other programs are not running like they used to, or at all anymore. This is particularly hard on the grade 12 students who really needed some of these programs for their university applications and scholarships. I sincerely hope that there can be a settlement between the government and the teachers since I don’t think anyone is happy right now under the circumstances. Because I have pushed myself to try so many new activities, I have also been introduced to so many new people that have become really close friends in a short period of time. I love training with new friends and I love singing and playing music with a completely different group of friends. I have my close friends that I’ve had for years and now I also have some very interesting and fun people in my life that I probably wouldn’t get the chance to meet if I hadn’t tried so many new things. I still don’t have a whole lot of free time, but when I do it’s nice to know that I always have great people to be with. My family is my rock. Without my supportive parents and brother I would not be able to do all the things that I get to do. For every hour that I’m training they still have to drive me around (until my full driving license) and wait for me since my training is so far away. The are just as committed as I am. I’m so happy that Greg still lives at home with us. I’m going to miss him so much when he moves out. I’m very thankful that I still have my grandpa living around the corner since he is very involved with everything that I do. 2012 was a great year for me and I am so excited for what I will do in 2013! Don’t Wait For Things to Happen…Go Out and MAKE Them Happen!